Reading Nadine Gordimer has a refreshing effect on someone (eee... me) whose day-to-day occupation consists mainly of writing for so-called writing platforms (marketplaces in sketchy disguise). Professionally I'm often in touch with people who cling for their dear lives to the idea that there is no difference between a writer and a copywriter. Sparks fly, no need to add. And my frustration mounts. Then enters Nadine Gordimer in her non-fiction outfit and reminds me what is a function of a writer - in her usual powerful, beautiful style. Hint: this function is NOT selling crap to people. For this reason I will always love Nadine Gordimer, but praises for her definitely shouldn't stop here. Gordimer has always been a fighter against apartheid, against censorship, against all sorts of observable injustices. I haven't read much of her fiction - one book perhaps, and I can't even remember the title - but her non-fiction has always left me breathless. She's political, oh yes. Yet, I have a feeling that she's not being political for politics sake, but because in some circumstances it is not possible to remain human without being political. I sense tremendous amount of compassion in her writing, as well as courage to defend the truth as she saw it, even if it happened to be an inconvenient truth. The Essential Gesture is no different. It is subtitled Writing, Politics and Places and this rather neatly sums up what the book is about. 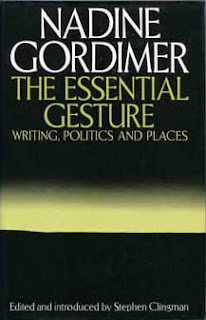 I've grown to consider essays on writing and opposition to apartheid a standard Gordimer's fare, what's new here (for me) is travel writing. The book includes a few short travelogues, among which The Congo River stands out as the best piece of travel writing I have read so far, anywhere. I didn't expect it but hell - give me more of such surprises, please! If I were to find a fault in this overall amazing essay collection, it would be this: some pieces are slightly too detailed, too involved, too remote to identify with for a foreign reader. I'm guessing they were written for South African audience (some are actually records of Gordimer's speeches), so I'm not really complaining, only... observing. Let's blame the editor - he's the one who made the selection, not entirely relevant to international readership. Even so, it's only a minor glitch, don't let it scare you off the otherwise fantastic book.